Give the gift of name blocks as home decor or corporate gifts. Know someone who is difficult to find a present for? Name blocks such as executive desk wedges and acrylic desk blocks are perfect solutions. Everyone loves to see their name on something, whether it’s your boss, an old friend or family member. And, many people love displaying famous quotes or motivational messages as interior decor. In other words, desk wedges and blocks make great gifts for just about anyone. Whether used for personal identification or interior decor, desk blocks and wedges add charm to any home or office. Here are three reasons why name blocks make excellent gifts for your friends, family and colleagues. It’s easy to customize your name blocks to suit any purpose. These quality name blocks can be used as elegant name plates, decorations, promotional tools or tokens of affection. Use one or two lines of text to express love and appreciation for a special person. Add your company logo to turn these products into corporate gifts for your associates. Have your name and title engraved to make a name plate, or personalize with your favorite saying to create home decor. The possibilities are limitless! Professional custom engraving and quality materials make desk wedges pleasing to the eye. 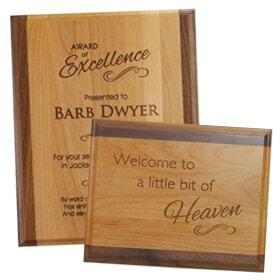 The solid wood has a beautiful finish, and the metal plate has a shiny surface that accents the laser engraving. 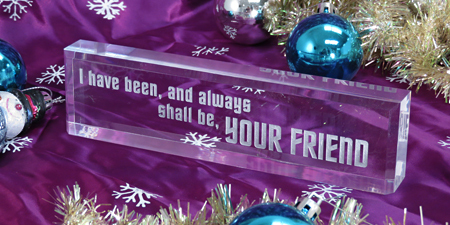 Acrylic desk blocks look stylish and modern with color filling in the engraved text. The beauty of these name blocks will make any recipient more than happy to display them on their desk or in their home. A personalized gift makes people feel special. Having a desk wedge for their office gives people a sense of pride in themselves and their jobs. For corporate gifting, giving colleagues a desk block with their name and title on it shows you value their contribution to the company. Name blocks with quotes, sayings or expressions of love for friends or family are unique gifts that will last a lifetime. Executive desk wedges come in different materials and sizes. The metal plate is fully customizable with your choice of color and finish. Customize one or two lines of text and an optional logo which are laser engraved into the metal plate. We offer to gift wrap your desk wedge for you so that you only need to worry about giving it to your boss, employee or friend. 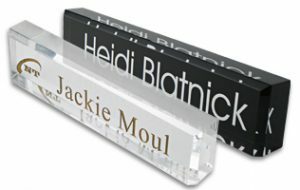 Crystalline acrylic desk blocks make beautiful identification products for your colleagues or friends. The clear, inch-think name blocks come with an optional black backing that makes the engraved text stand out. Select whether the text is laser engraved on the front or the back. Front engraving may include white, gold or silver color filling. With lots of font options, customize one or two lines of text however you want. Desk blocks may also include a logo or an image. If you have any questions about our executive desk wedges, acrylic blocks or other products, please call us at (800) 272-5729. We wish you happy holiday shopping! Liven your office Christmas party using name tags! The holidays are here again, and that means it is time to plan your office Christmas party. Each year you look for ways to make your Christmas party different or better than last year’s. That means changing the food, gifts, decorations or activities. Name tags are versatile products that can enhance a company’s celebrations in many ways. 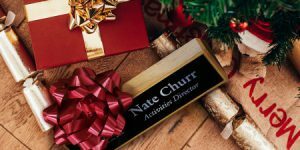 Here are three ways name tags can add variety to your corporate Christmas party and bring more holiday cheer to you and your colleagues. Placement name tags add class to your dining room table. Each employee’s name is laser engraved into a metal or plastic name tag, in an elegant font of your choice. Serving wine or cocktails at your event? Wine tags help distinguish one person’s glass from another. Party attendees attach a tag with their name engraved on it to the bottom of their wine or cocktail glasses so they can easily find them again. 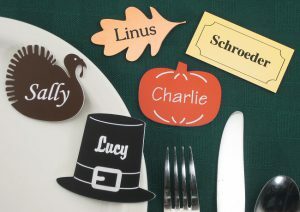 Name tags also serve as labels for a banquet table or potluck so attendees know which food is what. Exchanging white elephant gifts at your Christmas party? Name tags make it easy to draw a person’s name to see who gets to choose a gift first. And unlike with paper strips, you won’t have to rewrite their names again next year. If you want to have a different activity this year, there are several games you and your coworkers can play with blank name tags. Have each person draw a picture of something that represents them. Then, have everyone guess which picture belongs to whom. Or, write a question on each blank tag and give it to each person to pin on their shirt. Everyone then has to answer the question pinned on the person they’re talking to while they socialize. Be careful which markers you use as some markers may be permanent. Name tags make classy gifts, and having every employee wear a name tag that includes your business logo creates company unity and solidifies branding. 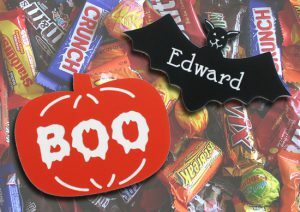 You may choose the color, font and fastener for your name tags. And, you decide whether to have an employee’s name engraved or leave the name tag blank. Already bought your employees Christmas presents for this year? A beautiful gift tag will make them feel extra special. 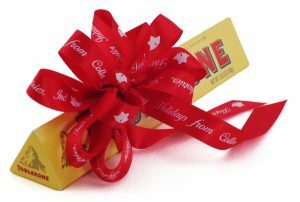 Tape a name tag to a wrapped present or attach it to a gift bag. Ribbons make great gift tags as well. 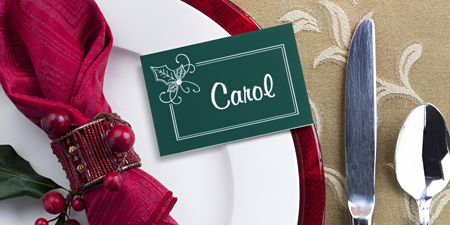 However you choose to celebrate the holidays, name tags can enhance your office Christmas party experience. 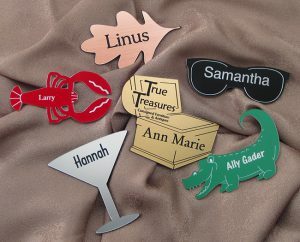 Custom shape name tags are perfect holiday ornaments! It has become a tradition in many homes to decorate a hand-crafted ornament each year for Christmas trees and other holiday decorations. 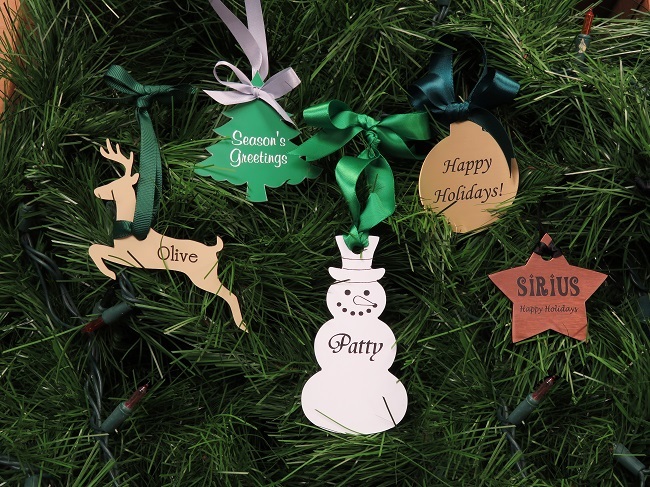 So, why not make your holiday ornaments easier this year with some custom shaped name tags? From snowmen to trees and stars to reindeer, custom shapes are perfect holiday ornaments! Or, add an extra bit of flair to your corporate name tags with a unique shape. Choose a shape that highlights your logo or goes with one of our many stock shape choices. A custom shaped name tag is a great way to draw attention to your company in a world of rectangle badges. A name tag with a custom shape, color and size make a visual verification of the name tag easier. These name tags draw the customers’ eyes straight to you, leaving them with nothing to wonder. The different shapes or sizes will help make your name tag stand out from the crowd. Just let your imagination run wild and design a badge that will separate you from your competition. But, don’t limit these shapes to just the office! Share them with your family and friends on your Christmas tree or by giving them away as presents. From holiday greetings to a special someone’s name, these creative holiday ornaments are sure to be a hit with anyone. Choose a color to match each shape, and we’ll engrave names or any other text you may want. If you order a blank badge, customize each shape with a permanent marker, stickers or anything that you might have around your home. Add names, drawings, images or write down memories with a permanent marker. Once you choose a name tag or badge for your ornament, make sure to add some personalized ribbon for hanging it on your tree! Just attach the ribbon to the back of the tag to for easy displaying. Or, hang it anywhere that you want to showcase your homemade talents. From Halloween and Thanksgiving to Christmas and other holidays, these custom shape holiday ornaments are perfect for any workplace or home. It’s easy to give perfect corporate gifts that everyone will enjoy. Showing appreciation with corporate gifts for your customers, clients and employees doesn’t have to be complicated. And, most importantly, it doesn’t have to be a gift that is mundane. We all have several promotional mugs, t-shirts and other items that we receive as thank you gifts. So, what makes you stand out from your competitors? Deciding on a product to give can be a difficult choice. And at this time of year, it’s important to start thinking about those corporate gifts. Not only is gift giving one of the best ways to improve office morale and grow and maintain your business, but it has become expected as a way to acknowledge a working relationship. 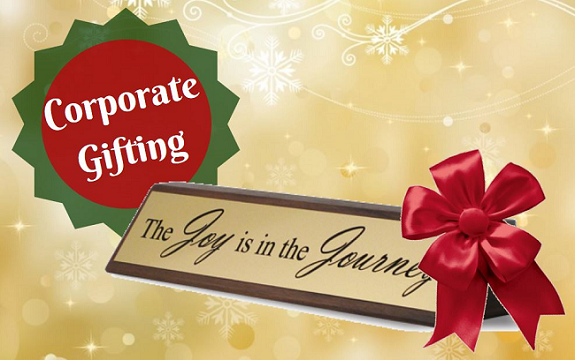 Corporate gifting is an opportunity to connect with your clients, strengthen employee ties, and share your holiday cheer. Recruiting, retention and business development are three other great reasons to give a gift. But don’t just give a gift because you think someone expects it. Give because you want to maintain these relationships. While fruit baskets and other homemade treats are enjoyable, why not make it something unique to the receiver? Go with something personalized this year. From custom shaped name tags to executive desk wedges, find and create something that will truly make your employees and clients feel like you care. Does your vice president have a favorite quote? Make them a unique acrylic desk block that they are sure to display proudly. What about your customer service department? Do they need new name tags? Choose from our large selection of custom shapes and material colors so that they know you notice them. Whatever the department or work environment, personalized gifts are sure to make the difference. Whether it’s a new name tag for you, a desk wedge for your associates or other personal identification products for your clients, custom-made gifts are always appreciated. And, we’re sure to have the right gifts for your needs! P.S. We suggest this every year, not because we make them, but because they do make a great gift even better. So, recognize each employee for a job well done this year with a specially wrapped gift and some branded, personalized ribbon!